Forget wearing your influences on your sleeve, how about tattooing them on your forehead? 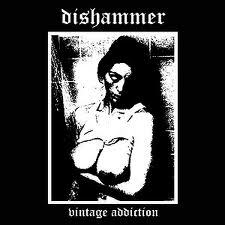 Even someone with a double-digit IQ and a passing interest in heavy music could hazard a guess at how Vintage Addiction, the debut from Spanish outfit Dishammer, might sound like. If you have wandered here from my British Sea Power post, I’ll let you off if you didn’t twig the blatant Discharge and Hellhammer worship.